Most current diet products rely on only one ore two of these methods of weight control. ThermoXplode is the first comprehensive product to sucessfully combine the best from all five major techniques into one efficient weight loss product. This required a special formulation in order to have all of the components operate in harmony with each other. ThermoXplode is the most complete Thermogenic formulation for weight loss available today. ThermoXplode combines one of the most effictive Thermogenic formulations ever developd with the most effective fat and sugar blocker available. Now, you can block and burn calories using one singel product and increase energy levels at the same time! 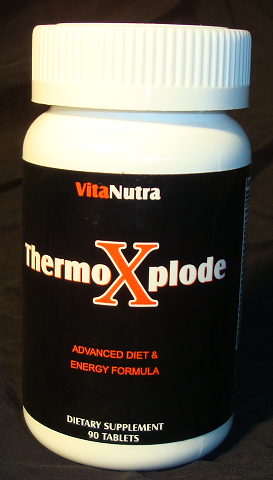 ThermoXplode provides natural diuretics, fat blockers, thyyroid stimulators and more! ThermoXplode super weight loss formula is designed to be the very best and most effective diet aid on the weight loss market! Only the ThermoXplode super fat burning, fat blocker formula has the fat burning power and fat blocking effectiveness in one total weight control package for the ultimate in Fat Fighting Power.